Xavier Watts‍ is one of the top 2020 wide receivers in the Midwest, but the Nebraska product is starting to receive interest as a potential defender as well. Watts has offers from schools like Notre Dame, Nebraska, Michigan, Wisconsin, Iowa, Iowa State, Kansas, Kansas State and Tennessee among others. Notre Dame is one of those schools that’s talked with the Omaha native about possibly playing cornerback. 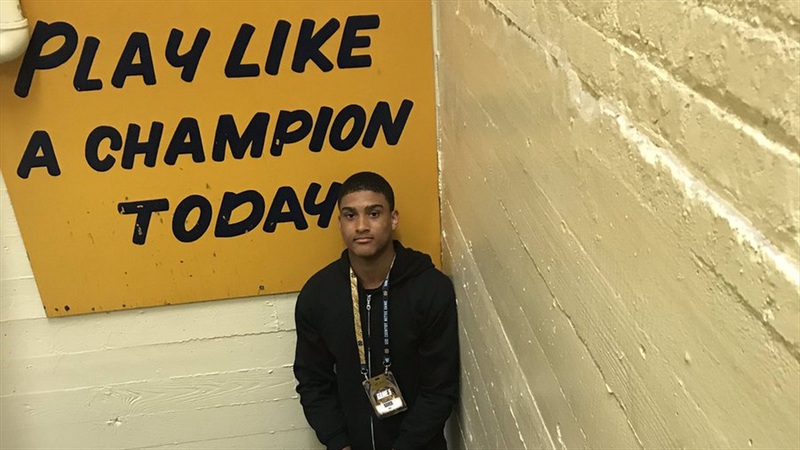 Watts traveled to South Bend on Wednesday for a visit with the Irish on Thursday. Limongi says Watts is a standout football player and person. “He’s tremendous at both,” the coach explains. “As a kid, he has high character. He’s an honor student. He’s very respected, very courteous, seems to try to do everything right. Limongi saw a pair of players sign with Nebraska this past cycle with linebacker Nick Henrich and tight end Chris Hickman. “Xavier had two excellent role models to follow and learn from,” the coach says. “He’s going about the process the same way those two guys did, which was perfect if you ask me. They listened to everybody, they’re courteous, they returned calls, they asked questions. They did their due diligence to find the perfect fit.